Want to build a panel on the Aria using FluoroFinder? Click here! 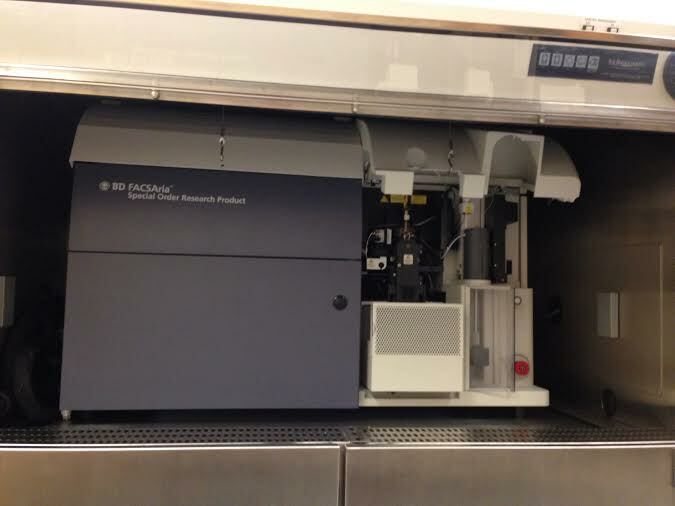 The BDFACSAria II SORP (a Special Order Research Product) is the cell sorter in the flow core. 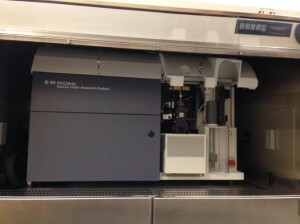 The system uses positive pressure to force samples through the cuvette flow cell, where hydronamic focusing moves sample particles in one by one through the laser beams for interrogation. There are a variety of adjustable settings on the instrument, including nozzle size, system pressure, laser and detectors, and PMT voltages, which allow the user to optimize each run for their particular sample. Cell sorting with this instrument allows up to four populations in a mixed sample to be separated and collected in separate vessels simultaneously. Unlike in analyzers (such as the Accuri C6), where the cells simple go the waste, these cells are preserved in appropriate buffer so that they can be further analyzed, later studied, and potentially even cultured after sorting. The Aria II can sort cells of a variety of sizes. Samples are sorted through a nozzle, and nozzles are available in the following sizes: 70um, 85um, and 100um. As a general rule, your cells should be no bigger than 1/5 the size of the nozzle, so please keep this in mind when designing a sort experiment. Standard pressure configurations for the nozzle sizes are as follows: 70um-70psi, 85um-45psi, and 100um-20psi. If you have concerns about the condition of your sample due to the pressure associated with the nozzle, the nozzle size can be changed (easiest solution) or the pressure can be changed (this is more complicated. Please notify the operator of your concerns so they can be discussed). Populations to be sorted on the Aria II are accepted in 12x75mm tubes (BD Falcon 5ml polystyrene round-bottom tubes, catalog number 352052 or equivalent). Samples can be sorted into a variety of collection devices, including 1.5ml microcentrifuge tubes, 5ml tubes, and 15ml conical tubes. Samples can also be sorted into plates (96-well, 394-well, etc) and onto microscope slides. Sorted samples can also be temperature-controlled via a water bath that is housed in the instrument if necessary. There are a variety of purity modes to choose, including enrich, yield, purity, and 4-way purity. The choice depends on what you intend to gain from your sorted population(s). Please view the information on sort purity for more information or contact the operator for assistance. Please note that it is possible to measure some other fluorochromes on these channels. There are also some additional filters available to extend the range of fluorochromes which can be measured on this instrument. If you are interested in using a fluorochrome which is not listed here, please contact the operator to discuss. Click here to view the Aria II user guide. Click here to view the BD FACSAria systems page.Click here to view the BD Fluorescence SpectraViewer. Please note that while the SpectraViewer is a great tool for estimating fluorescence spillover and designing multicolor flow experiments, it is still necessary to discuss the choice of all fluorochromes with the operator to ensure that they are compatible with the instruments in the flow core. Please contact the operator if you are using any fluorochromes not listed in the detector arrays described above or if you have any questions.